The Stories Why is Disability Arts Political? Why is Disability Arts Political? Georgia Macqueen Black, Marketing and Website Officer for NDACA, was invited by Battersea Arts Centre to give a talk on disability arts history. Here, you can read Georgia’s piece in full, which explores her own take on disability arts and why she believes it cannot be separated from disability politics. Hi, my name’s Georgia Macqueen Black and I’m here to talk to you about the National Disability Arts Collection and Archive, otherwise known as NDACA. 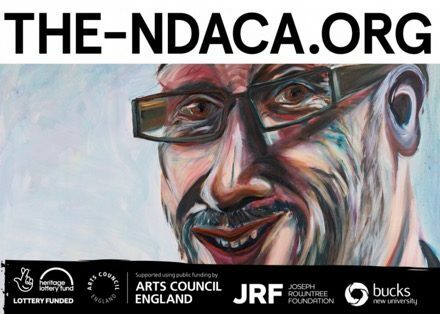 It was a celebratory event when NDACA was collectively awarded £1-million funding from Heritage Lottery Fund, Arts Council England and Joseph Rowntree Foundation, to create an archive that would celebrate the unique creativity of disabled artists and activists. To many, the funding felt like a long time coming. It was the disabled artist Tony Heaton who in the early 1990s first made plans for a physical archive that would record and critique a collection of ‘Disability Arts’. At that time, Tony was the CEO of the disability-led organisation Holton Lee in Dorset. As the first home of NDACA, Holton Lee is an important location within the history of the Disability Arts Movement. It was an exhibition space for disabled artists and also offered residential courses. Back in October 2015, the NDACA project amam discovered 70 boxes of records relating to the National Disability Arts Forum stored away in the attic! Before I delve into the history of disability arts further, I wanted to introduce myself and explain how I came to work for the Archive. After graduating from university in June 2015, I volunteered at the disability-led arts organisation Shape Arts to organise NDACA’s first public event. 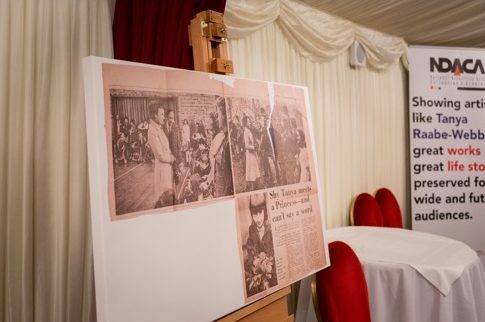 This was supposed to be a celebration event at the House of Lords, an opportunity to mark the project’s £1-million funding and a chance for the patron, Baroness Campbell of Surbiton, to bring disabled artists and activists together to commemorate their past. nging the seminal disability protest song ‘Choices and Rights’. To me, the photo commands attention because of the ‘fist-in-the-air’ expression of the British Sign Language interpreter. She conveys the fight of the song. The next slide shows a close-up of one of the items on display at the event. I decided to enlarge a selection of deposits, transforming disability arts ephemera into new ‘artworks’ printed on a canvas, a mini-exhibition of the finished collection. This particular canvas depicts one of our most fragile deposits, a newspaper article from some 40 years back of the disabled artist Tanya Raabe-Webber: ‘Shy Tanya meets a princess and can’t say a word.’ This headline would have been an easy take on a disabled child’s life, marked by sickness and perhaps the occasional visit by a member of the royal family. Yet the Tanya I met in 2015, successful and practising visual artist, was assertive and completely in control of how she wants to live her life. I’d also like to give you a quick outline of the different forms NDACA will take when the project launches to the public in 2018. One of our main events will be the launch of the-ndaca.org, the website which will host many of the different elements of NDACA: its catalogue, oral histories, learning resources, animations and much more. We are building the website with the audience in mind, so that the user can easily navigate the many pieces of our disability arts puzzle. We have built a ‘tagging’ function into our oral history films, which will allow the artworks or deposits discussed in the film to appear while the film is playing. We will also ensure that the-ndaca.org presents the Archive as an evolving project. We have not completed preserving disability arts culture, and we hope past and present disabled artists will be encouraged to get in touch and deposit into the collection. The website should function as a space for disabled people to comment on and access their heritage. We are also currently building the NDACA Learning Wing and Repository at Buckinghamshire New University. This will be an accessible wing in Bucks’ existing library, developed and built by a team of disabled and non-disabled designers. Key works from the collection – such as Tony Heaton’s performance piece ‘Shaken not Stirred’ (1992) – will be transformed into accessible models, and the NDACA Display Wall will contain a selection of audio-described disability art pieces. The NDACA Repository will be the primary storage location for NDACA materials and resources deemed too valuable or fragile to go on general display in the NDACA Wing. These include rare books and several document research collections of disability art organisations. NDACA users can also discover a wealth of paintings and other original artworks, posters, photographs and other ephemera. One of the most engaging resources on the NDACA website will be the oral histories. To date, we interviewed over thirty people who have strong memories of the Disability Arts Movement. It was an honour for me to listen in on the interviews and hear about the particular trials of working in the arts as a disabled person, and learning whether disabled people felt that progress has been achieved today. One moment from the interviews has stuck with me. Deborah Williams, a disabled performer and activist, said quite simply: ‘I’ve lived a life where the world for me doesn’t fit.’ She was referencing what it feels like to ride an escalator on the tube with one hand. The anecdote gave me insight into the everyday occurrences that could contribute to a disabled person becoming an activist or campaigner, to fight against the injustice that no-one else seems to recognise. Deborah’s statement forced me to consider the wider implications of being disabled, that in order to access education, transport, information or fair representation as a disabled person, you have to think strategically. The structures of society are where the problem lies, not with the disabled person’s body. This is why the Social Model of Disability was revolutionary in reframing disability: an impairment is fact of someone’s existence, but disability is imposed on disabled people by society, and barriers – once named and recognised – can be overcome. At the heart of the Archive lies 3,000 deposits. It is these artworks, ephemera and objects – in a unified collection for the first time – which tell the history of the Disability Arts Movement in extensive detail. It is thanks to the deposits of disabled artists and activists that NDACA could be built. Hidden-away and personal items – the British Council of Disabled People pamphlet tucked away in someone’s attic, the old cassette tapes of Ian Stanton’s protest songs – have been identified and renewed in our digital catalogue. The project team understands that the Archive we are working on is fundamental to disabled people reclaiming their history. ‘Disability Arts’ is not ‘new’. For forty years it has been an integral aspect of the wider Disabled People’s Movement, part of the jigsaw that makes up disabled people’s battle for rights in the UK. The work has been developing over many years, and some of the leaders of the Disability Arts Movement are no longer living to see the heritage fully documented and revived. One such leader is the late sculptor and artist Adam Reynolds. His death, amongst others, further resolved disabled artists to build a permanent national disability arts archive. Adam was known to treat everyone he met with the same level of respect and kindness. He was a talented artist, an activist, worked on the art panel of the Arts Council, developed the Disability Arts Strategy with the Southern Arts Board and sadly died two days before his performance piece Sisyphus was going to take place at Tate Modern. At the Disability Arts conference 21 in 2002 at Holton Lee, disabled people were arguing over questions relevant to their shared culture of practice: does my experience of a disabling world have to be so obvious? Should disability always be the central focus of my work? Have disabled professionals sold out? Adam was ever the diplomat, defusing the situation by describing disabled artists a ‘family of cousins’. Adam’s gentle humour is still remembered and missed by his disabled ‘cousins’ today. His ethos and attitude will hold NDACA together, along with so many other disabled artists who are no longer with us. The beginning: how to define disability arts? The quick history of disability arts that follows is a consequence of muddling through the Archive over the last two years. I do not claim to be a spokesperson for the Disability Arts Movement nor do I have the definitive answer to what ‘disability arts’ means. However, I mentioned those moments of disagreement at the conference with Adam Reynolds for a reason. What I have often rediscovered is how disability arts means many things to many people. That’s a clear position to start with. But the subjectivity of ‘lived experience’ expressed through disability arts – how one person communicates their impairment or disablement in comparison to another, what the disabled artist Steve Cribb called an opportunity to ‘express those emotions we have been denied’ – means that it might not be helpful to explain the medium through individual artists. Instead, I will present disability arts as a set of practices that strengthens disabled people’s collective awareness; a medium which carries a tangible, emotional quality and has managed to shape disabled people’s identity. Each artwork, created by a disabled individual who understands the world through its injustice and oppression, adds another piece to this expansive puzzle called disability culture. I don’t think I can teach you about disability arts through defined aesthetic criteria. Perhaps you cannot recognise the artistic features of ‘disability art’ in the way you can recognise those of a Cubist painting, with its flat two-dimensional surface, strong use of colour and angular shapes. After all, disability arts is part of a collective movement, not a school of art. But I can tell you that disability arts, with the politics of disability at its core – can take many forms. Here is an image of one of the early 1980s productions performed by Graeae, the first theatre company set up entirely by disabled actors. Here’s another picture from one of Graeae’s early productions. Nabil Shaban is second from my right – he co-founded Graeae in 1980 and was one of the first disabled artists to break into the mainstream art word, appearing as Sil in Dr Who in the 1980s. 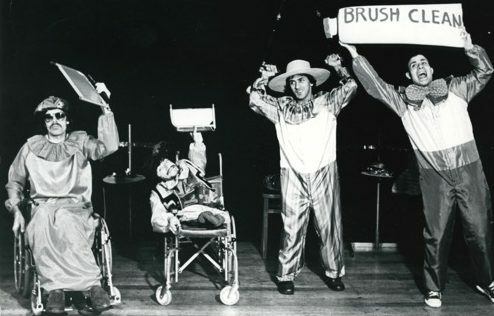 To me, the photo depicts what might be called the anti-professionalism and fun of early disability arts performances. The first Graeae production was called ‘Sideshow’ – it was part burlesque, part satire, and featured an array of characters trapped in a fairground freak show. It disturbed non-disabled audiences and affirmed disabled people’s emerging artistic vision. They were used humour and creativity to distort negative stereotypes of disability, and I think this picture captures the power of disabled people making fun of mainstream society’s view. 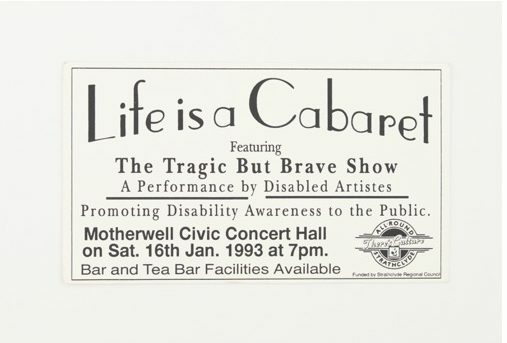 This poster from a later disability arts event – the touring cabaret group ‘Tragic But Brave’– conveys that same anti-professionalism and controlled chaos continuing into the 1990s. The ‘Tragic but Brave Show’ was satirically brilliant, as disabled artists questioned the dominant able-ist narrative of being viewed as tragic and/or brave. In 1992, lead performers of the company (Johnny Crescendo, Ian Stanton and Wanda Barbara) performed at Glastonbury. The story goes that despite their wheelchairs getting stuck in the mud during the festival, the performance was very well received! Originally created for disabled audiences, these performances were raucous and incorporated singing, comedy and dance. I wonder how a disabled person must have felt seeing disabled performers on-stage, maybe for the first time. The cabaret circuit created a point of connection between disabled performers and audiences; an evening out with confident individuals who expressed the emotions of their disabled identity. 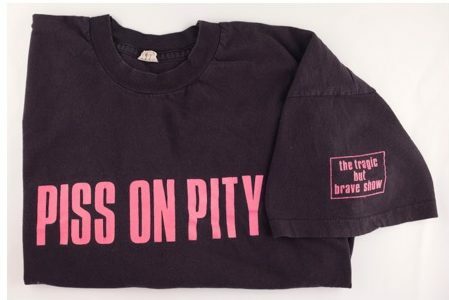 The songs – ‘Choices and Rights’, ‘Chip on Your Shoulder’ – were rallying calls to disabled people who were awakening to their political voice. Disabled artists were also innovative with the forms of their artwork. 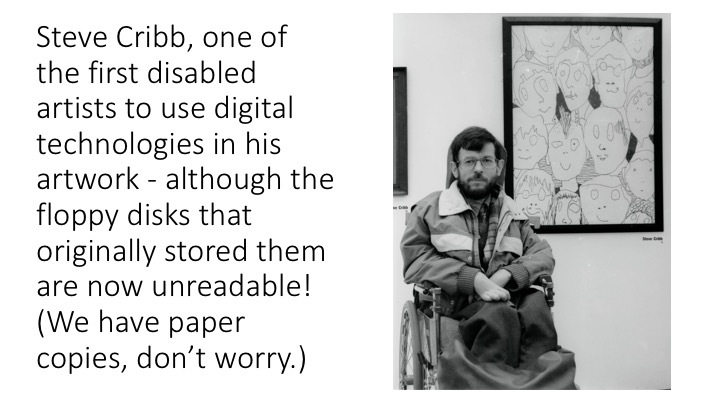 The disabled artist Steve Cribb was one of the first disabled artists to use digital technologies. He also participated in public demonstrations organised by the Direct Action Network for accessible transport and equal rights (risking arrest in the process!). The 1980s were a productive era for disability arts and politics, as disabled people established their own organisations to campaign for access, employment and transport. Steve’s work thoughtfully commented on the politics of disability and his skills as a writer allowed him to regularly review exhibitions and events. Disability arts can also be practised through sculpture, manifested in this Adam Reynolds piece. 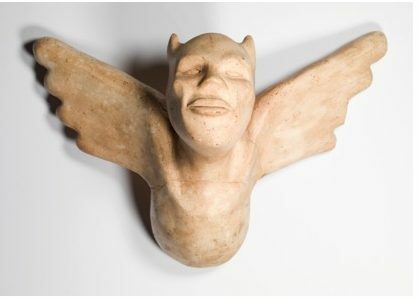 ‘Cherub’ is one of Adam’s early sculptures, one of his gargoyle figures – a figurative piece in comparison to his later more abstract work. The heritage of disability arts can be understood through music. Ian Stanton was the leading political balladeer of the Disability Rights Movement until his ultimately death in 1998. Born in Oldham in 1950, he used music and humour to expose the prejudice towards disabled people. The Greater Manchester Coalition of Disabled People recruited Ian to produce the Coalition Magazine, which provided a forum for disabled people to discuss ideas. Ian would often headline all-disabled line-ups for disability arts events and was able to spread his message of autonomy through his rebellious humour and sincere nature. I’d like to read some lines from one of his songs, ‘Message from Telethon’, which protested against the ITV’s annual fundraising broadcast to raise money for ‘pitiable’ disabled people. Back to the politics: to be normal and disabled = a political problem? Hopefully I’ve been able to give you a small insight into the variety of artforms within NDACA. Working for this project has given me access to the individuals who were so respected and loved within the Disability Arts Movement. But I also think it’s important to consider the wider implications of this history, such as the ideas around identity that flourished within a network of artists and campaigners. This was a Movement with serious artistic and cultural aims, and the politics disability often cut through. As disability arts organisations established themselves in the 1980s, disabled people grew in confidence to campaign for societal change through free expression of the arts. The burgeoning community of disability arts in the UK was about creating spaces and forums for discussion as much as it was about organising exhibitions. Arts events were an accessible route for looking at the world in relation to disabled people. The depositors of NDACA were marginalised, sent to educational institutions where basket weaving was the only learnable skill. The Archive has taught me that disabled people wanted to split apart whatever constitutes normality. If the opposite of an ‘able-bodied’ life means accepting isolation, disabled people had no choice but to fight back. Disability arts was their chosen tool, and this quote on the slide behind me illustrates that to love yourself because you are disabled is political. The natural act of being kind to yourself shouldn’t be a surprising political stance, but to a disabled person in the 1980s, that was their armour. You may have come across the Social Model of Disability. It was one of the first models created by disabled people and their allies that transformed how disability was understood. Rather than being the ‘fault’ of an individual who was not capable of enjoying life to the full, the Social Model identified disability as the loss of opportunities to participate equally in society because of physical and social barriers. 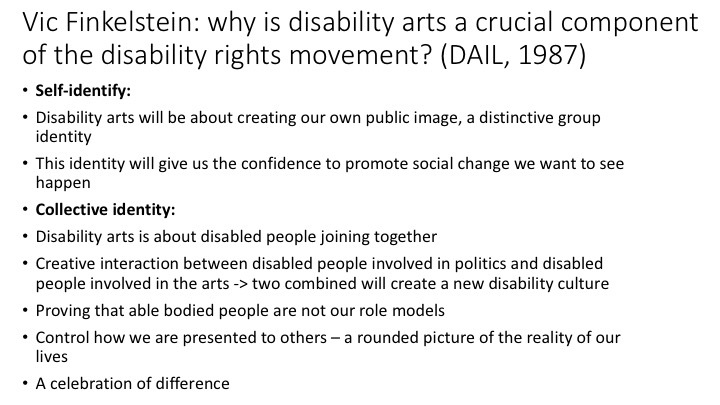 The two faces on this slide – Paul Hunt and Vic Finkelstein – were two leaders of what became known as the Disability Rights Movement, which had the Social Model at its centre. At 19, Paul Hunt went to live at the very first Cheshire Home, a care home for disabled people. It was here that Paul met a community of disabled people intent on campaigning for their rights and inclusion. In 1972, Paul published a letter in The Guardian which would go on to have a far-reaching effect on the lives of disabled people. He invited disabled people to form a new organisation that focused on all aspects of the discrimination they faced in their lives (at the time only the Disabled Income Group was campaigning). Along with Vic Finkelstein – who responded directly to the letter – the Union of the Physically Impaired against Segregation (UPIAS) was formed. The UPIAS radicalised how people thought about disability. They separated impairment from disability, conceiving the latter as a social construct about barriers. This theory was developed by Mike Oliver and others into what became the Social Model of Disability. 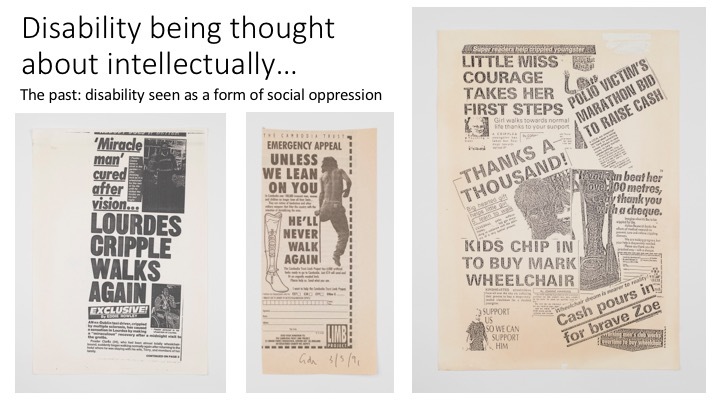 In the 1970s and 1980s, disability politics offered an alternative point of view to the negative media representation of disabled people. Many newspaper clippings such as the ones depicted on this screen have been kept by depositors as evidence of the able-ist norms they were fighting against. Yet even when disabled people did achieve mainstream inclusion, such as the Arts Council supporting the work of disabled artists in the 1990s, prejudice could strike again. When relying on mainstream society to change, progress can be fragile and slow: in 1988, the disabled actor Nabil Shaban was denied work on the Granada Microman children’s TV series because executive producers were worried children would find him frightening. 60 disabled people demonstrated after Granada dropped Nabil. This political cause and effect, of a disabled person being punished and disabled allies fighting back, strengthened the collective identity of disability arts. The stronger the Movement, the louder disabled people’s voices became and the more determined their need to fight back. The Social Model argued that disabled people were excluded from society. This exclusion meant disabled people were often not awarded places in higher education and found it difficult to establish careers within the mainstream arts world. Vic Finkelstein – one of the leading activists in UK disability politics at that time – was also at the forefront of disabled people’s campaign to have equal access in the arts. In 1986, he and other disabled artists founded the Disability Arts Forum as a space to confront the lack of provision for disabled people in the arts. The Forum led to the establishment of Disability Arts in London (DAIL) magazine and the London Disability Arts Forum (LDAF). These organisations helped professionalise disability arts, hosting conferences, seminars, festivals and exhibitions that aimed to celebrate and discuss disability culture. They created routes for disabled people into the arts, allowing an oppressed group of people to have careers that were separate from the established art world. 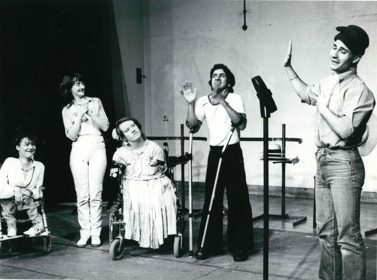 It was in the 1980s that other disability-led arts organisations emerged: Heart ‘n’ Soul, DaDaFest, Shape Arts –which expanded into a co-existing Shape network across the UK, with 11 independent services providing regular workshops, professional performances and campaigns to raise awareness about the Social Model of Disability. I wanted to draw your attention to this particular article by Vic Finkelstein from 1987, which conveys why disability arts is such a crucial aspect of the Disability Rights Movement. To me, Vic uses this article to comment on how disability arts could develop into a forum to analyse politics. In the 1980s, arts practices became a way of culturally engaging with disability politics. Vic and other disabled artists saw disability arts as a force which embraced disability and did not worry about the so-called ‘abilities’ of non-disabled people. Disability arts would be the environment where disabled people could promote positive ideas, a burgeoning culture that would act as a campaigning mechanism to remind the public of disabled people’s stake in multicultural society. 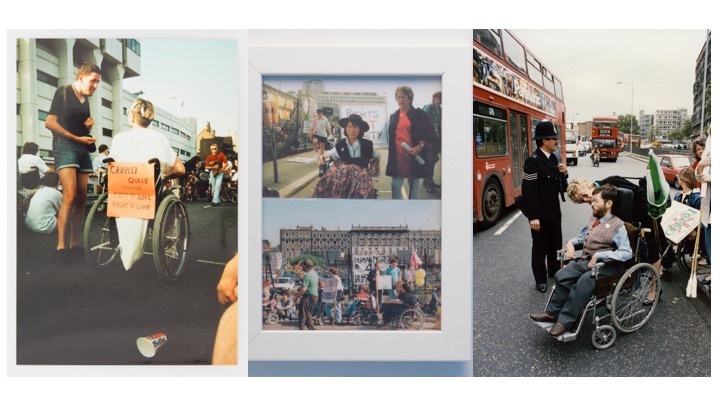 These photographs from a disability conference in the early 1990s display disabled people coming together as a community, listening to each other and forming the building blocks of future campaigns. The more seriously disability arts organisations established themselves, the more frequent were discussions around art and disability. 1991 saw the first ever disability arts and culture seminar organised by Shape. These seminars were environments in which disabled people could discuss how to gain greater access to art activities and how best to exhibit and curate their disabled identity. To touch quickly on the disability arts groups and events that flourished in the late 1980s and 1990s: there are the regular meetings of the London Disability Arts Forum, the Tragic but Brave cabaret roadshows, the Survivors’ Poetry Network, the publication of ‘The Creatures Time Forgot’ by David Hevey, which corresponded with an exhibition at Camerawork gallery, the Disability Programmes Unit at the BBC and disability arts festivals happening yearly in London and across England, such as Movin’ On’ at Trafalgar Square. The frequency of these events strengthened the politics of disabled people and their allies. To me, participating in an event where you could share your experiences as a disabled person would have been politically empowering. To me, it is the protests of the 1990s where disability arts and politics fuses together. Protests often incorporated music, poetry and comedy, and these images convey the shared community and energy of the arts, how they provided the momentum for disabled people to change society. 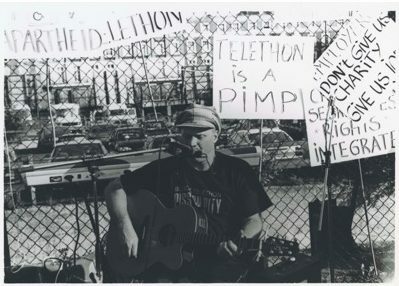 This particular photograph shows the disabled singer Johnny Crescendo at the Block Telethon protest of 1992, when 2,000 disabled people marched near the Southbank to call for the end of charity broadcasts that pitied and disrespected disabled people. 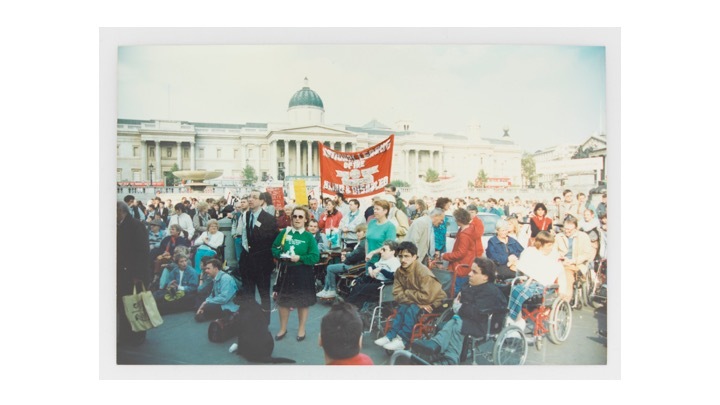 Protests organised by the Direct Action Network (one of the leading disability campaigning groups of the 1990s) created opportunities for disabled artists to come together, driven by rage and hatred of oppression. The Direct Action Network (DAN) wanted to be visible and troublesome. The 1970s had brought the Race Relations Act and the Equal Pay Act, and had seen weak attempts at disabled people’s rights too. But, by the early 1980s and 1990s, there still had been no confirmation of disabled people’s rights. DAN and their supporters chained themselves to buses, stopped traffic on Oxford Street, and would send out Press Releases proclaiming that ‘arrests would be likely’. Sometimes, disabled activists were let go quickly after their arrest, as police vans were not accessible! This was the period of audacious political slogans: ‘Nothing About Us Without Us’, ‘Tear Down the Walls’, ‘Piss on Pity’, ‘Proud, Angry and Strong’. They were incitements to real political change – the Disability Discrimination Act was passed in 1995 partly because of the determination of disability campaigners. I think about what it must have felt like to hear that poem amongst your disabled friends and allies, and I know that the deposits of NDACA will truly change the assumptions people make about disability today. 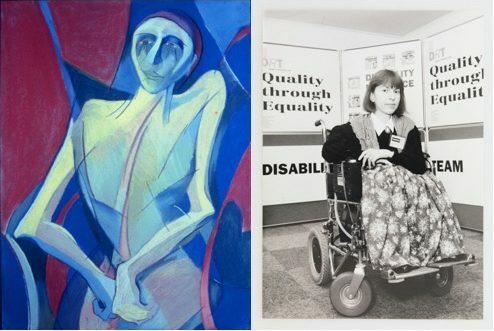 I’d like to leave you with these two images – one a self-portrait of the award-winning disabled artist Nancy Willis and the other a photograph of Baroness Campbell. Nancy has regularly exhibited in group and solo exhibitions and works across a variety of media. Baroness Campbell has been a campaigner for disability rights all her adult life and is now a cross-bench peer at the House of Lords. Neither of these disabled women feel anything other than normal unto themselves – impairment is simply a fact of their existence. It is the barriers of an inaccessible world that makes disability political.